Since Facebook can’t always be relied upon to deliver with its mobile app, consumers frequently gravitate towards some of the many third-party offerings available at both the App and the Google Play Stores. 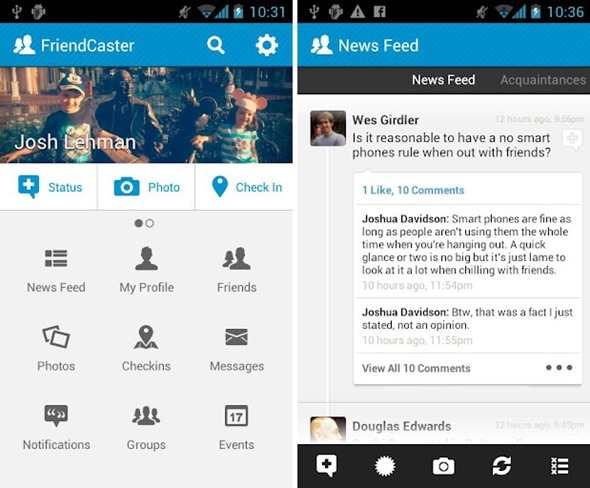 FriendCaster, the foremost third-party app specific to the world’s number one social network, boasting in excess of three million downloads hitherto. Developers OneLouder, behind the fairly popular TweetCaster app for Twitter users, have just released version 5.0 of FriendCaster for Facebook, offering a whole bunch of improvements. Its trump card is undoubtedly the real-time Facebook notifications app – the first third-party app to offer such a feature to Android Facebookers. It packs in all the little extras you would expect from a decent Facebook app, and then some. You have all the basics such as status updates, photos, messages, events, groups, check-ins, all of which are supplemented nicely by five beautiful, interchangeable color themes. As has been the case with many apps recently, developers are recognizing what we like to call the great, belated Ice Cream Sandwich rollout, and giving apps an aesthetic makeover more visually in-keeping with Google’s latest and greatest mobile OS. 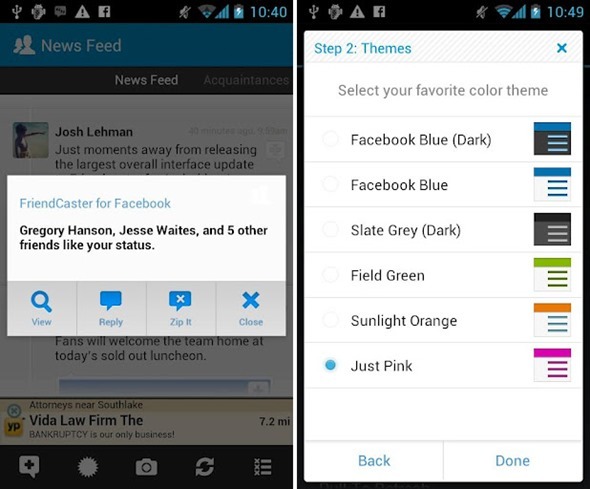 FriendCaster for Android is billed as being "designed specifically for Android and Ice Cream Sandwich," and certainly delivers on that front, providing a visually-pleasing experience to match the new features. You can stalk keep up on where all your friends are by consulting the check-in map of all your nearby friend’s locations. 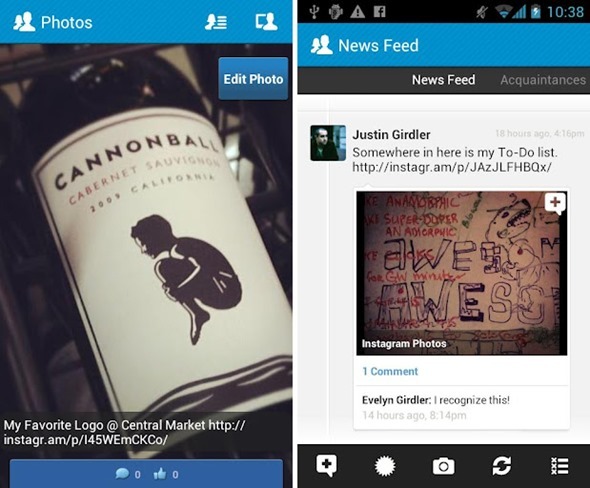 In addition, upon opening up the app, you are greeted with your cover photo in all its glory, adding to the streamlined, tidy look of the app in general. To top it all off, it’s free of charge, so there’s absolutely no risk in giving it a go. With such an expansive user base and a variety of quality features – allied to the great new look – it certainly gives the official app more than a run for its money. Download it, give it a whirl, and let us know if you’re impressed or not by dropping us a comment via our Facebook or Google + pages.